File photo of Supt. Marvin Marcos in combination with the emoji raised by PNP chief dela Rosa. MANILA – The eye roll. 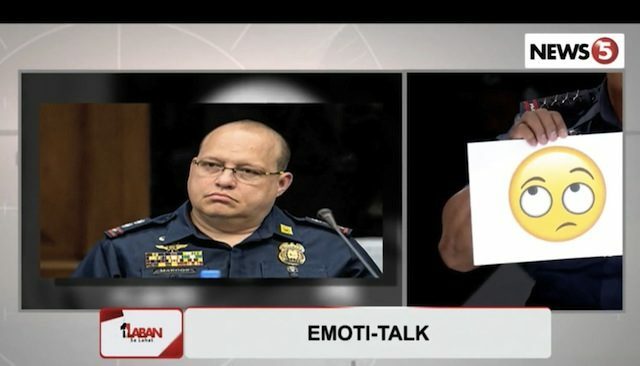 This is the emoji Philippine National Police chief Director General Ronald “Bato” dela Rosa associates with Police Superintendent Marvin Marcos, who was among those accused in the killing of Albuera, Leyte Mayor Rolando Espinosa while detained at the Baybay Provincial Jail in November 2016. Marcos, along with 23 other members of the PNP’s Criminal Investigation and Detection Group in Region 8, had been facing murder charges, but it was downgraded by the Department of Justice to homicide. Marcos was then released from prison after posting a P40,000-bail. The downgrading of charges has sparked a furor in the Senate, where two committees – Justice committee, chaired by Sen. Richard Gordon, and Public Order, by Sen. Ping Lacson – had concluded, after an inquiry, that the Espinosa killing was premeditated murder. Six senators introduced a resolution on Tuesday denouncing the downgrading. During an interview on Wednesday over News5’s digital program “Isa Laban Sa Lahat”, dela Rosa nevertheless said that this showed that the justice system was working in the Philippines, because Marcos was given the chance to post bail. “Whether we like it or not, that is the process, the legal procedures, that are working,” dela Rosa said. But he added that the DOJ must answer questions about how the incident would affect public perception of the police and the justice system. In April, philstar.com reported that dela Rosa had approved the PNP’s Internal Affairs Service report on the killing of Espinosa, and that the PNP chief had supported the IAS’ recommendation to file cases against Marcos and the other members of the PNP-CIDG in Region 8. Dela Rosa had also said that Marcos had been removed from his post after it was found that he was supposedly involved in illegal drugs. However, he was reinstated upon President Rodrigo Duterte’s orders. Dela Rosa added that he would follow Duterte’s wishes as the commander-in-chief, and a lawyer, at that. “Okay lang nasupalpal ako. Sino naman nasupalpal sa akin – Presidente (It’s okay that I was rebuffed, because who did it? The President),” dela Rosa said, using a basketball metaphor. He added that Duterte had his reasons for his actions. “Please, I am just the Chief PNP,” dela Rosa said.